Do Corps of Engineers projects need outside review? 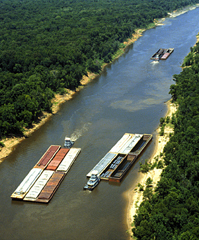 The U.S. Army Corps of Engineers has played an unprecedented role in reshaping the nation's landscape — dredging channels for shipping, building hydroelectric dams to provide rural electricity and erecting levees to guard against lowland flooding. But now an unlikely coalition of environmentalists and fiscal conservatives says the agency uses faulty economic assumptions to press for costly, pork-barrel projects that damage the environment while providing little benefit to society. Environmentalists also say Corps projects in support of developers or large-scale farmers have been especially harmful to the nation's wetlands. The Bush administration is taking aim at the agency budget, but many in Congress insist on continuing to fund big projects back home. Meanwhile, a bipartisan group of lawmakers insists on overhauling Corps procedures before approving any new projects.